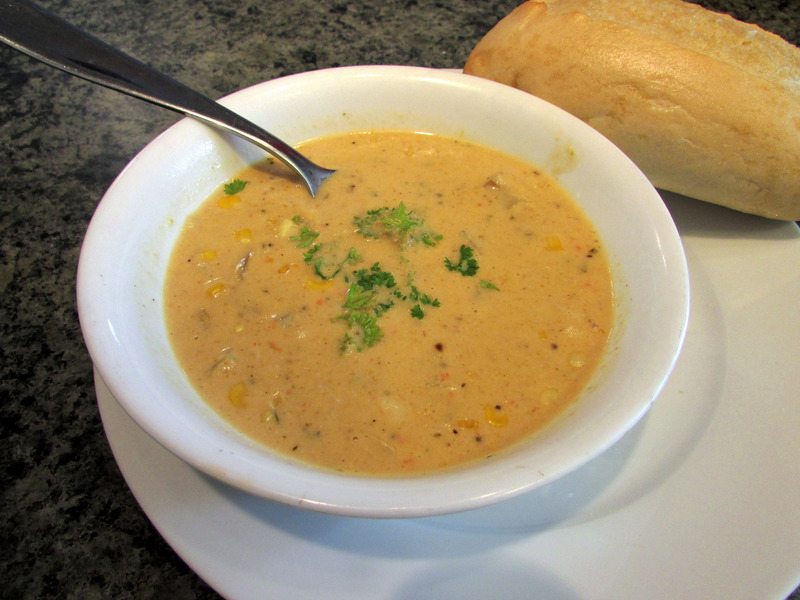 As the weather turns cooler, thoughts turn to… chowder! Since I used one can of crab for the appetizer, I will use the other can of crab meat for… you guessed it, chowder! You can’t just buy one can of crab… or at least I can’t. Add it to some chicken broth and milk, with some corn, and a shake or two of Old Bay seasoning, and you can make a simple Chesapeake Bay style staple. Heat butter and oil in large saucepan on medium heat. Add potatoes, onion, celery, bell pepper, Old Bay Seasoning and bay leaf; cook and stir 8 minutes or until potatoes are tender. Sprinkle with flour; cook 2 minutes, stirring constantly. Stir in milk and chicken broth. Bring to boil. Add corn and crabmeat. Reduce heat to low; simmer 5 minutes. Remove and discard bay leaf. Not for something different, simple dressings for salads, and a word or two about balsamic vinegar or ‘aceto balsamico’ to sound classy. Surprise! The real balsamic vinegar isn’t a vinegar at all. True vinegar is acetic acid and water, the result of the fermentation of ethanol by acetic acid bacteria in various liquids which contain the simple sugars such as wine, cider, rice liquid. Which is where we get the express that vinegar is a good wine gone bad. But true Balsamic vinegar, the outrageously expensive bottle, isn’t the result of any fermentation, but is reduction of cooked white Tebbiano grape juice. The Balsamic in my pantry is actually red wine vinegar with caramel color and ‘additives’ to make it an awful lot like the expensive one. Combine all the ingredients into a shaking bottle and shake away. Then, shake some on your salad! 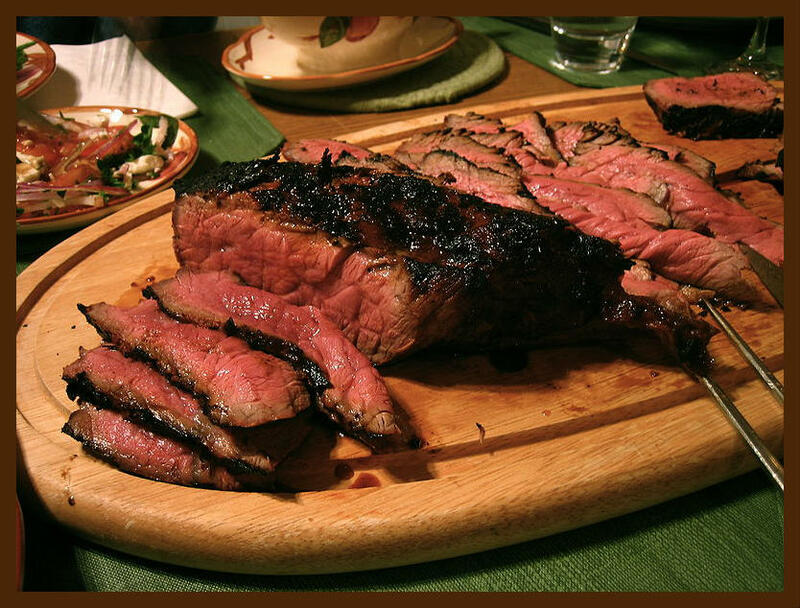 Marinades generally consist of an acid to tenderize tough cuts of meat, with an oil to promote juiciness, and herbs and spices to enhance the meats natural flavour. I use this little marinade for seasoning top round cuts of beef and make fajitas with a side of pineapple salsa. Soak dry chilies overnight in water, until soft, then remove seeds and toss all of the ingredients in a food processor. Puree until smooth. Spread this mixture over a nice cut of top round and let it soak for at least one hour before grilling it up. Slice it thin and use this for fajitas. 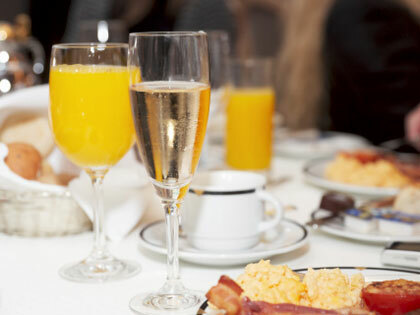 Brunch, I’ve been asked about brunch with seafood. One thing that I like to whip up for a late morning, early afternoon brunch is crab scramble. Its fairly easy to make, the secret is to remove physically remove the pan from the heat before the eggs are cooked through. The residual heat on the pan itself will finish the cooking while bring the eggs to the plate. If you have ever whipped up scrambled eggs and put them on a plate and had tight crumbles of egg surrounded by water, it is because the eggs are over done. The excess heat in those eggs is what wrings the water out of the protein. If you remove the pan from the heat before the eggs are cooked through, you will have eggs that retain their moisture. Melt the butter in a good frying pan. Saute the pepper and onion, then add the crabmeat and continue cooking till the crab is slightly browned. Now break the eggs into a measuring cup or pourable bowl and whisk them up with the milk. Add this to the pan and reduce the heat to low. Stir with a spatula using a folding action. As soon as the egg curds start firming up, remove the pan from the heat. Continue folding for a minute, then portion the scramble onto the plates. This goes nicely with Mimosas. I know it’s a day after Memorial Day, but I’m still not done. 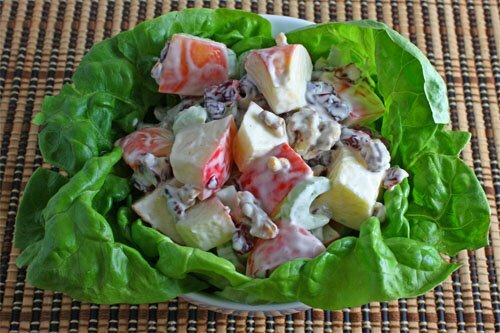 Another great summer treat is Waldorf salad. We are working on a variation on a theme and I think the theme is picnic food. I like light, easy, pack-n-go salads for picnics. This particular salad is vegan friendly, but I will check with my vegan friends and confirm this. I do know that no animals were present in the making of this treat. Chop three apples granny smith, cause I like granny smith apples, into small chunks. Then wash them in 3 tablespoons cider vinegar. This prevents browning. Then fold these into one cup of good quality mayo, add a pinch of seal salt and a grind or two of pepper. This is the basis, a well balanced basis of the salad. Now, for the variation, add to this base; 1 cup raisins, 2 tea spoons of curry powder, 2 ribs of celery, and ½ of a red onion shredded. Fold each item into the salad till its well mixed. Finish with a garnish of chiffonaded mint leaves and you are certainly good to go. The waldorf salad is traditionally served on lettuce leaves, and for this I have a personal preference for Boston lettuce leaves as they are particularly ‘bowl-like’ in shape. The fresher the scallop, the more I prefer the simple sear cooking. I picked up some very nice large sea scallops and, as Best Yet market was running a sale on red cabbage, I figured that I would keep things simple, and use up the bacon I had left over in the fridge. Now, I know, most people would reflexively wrap the scallops in the bacon and grill them up, but I would rather add the bacon to flavor the coleslaw and leave the freshness of the scallop alone. 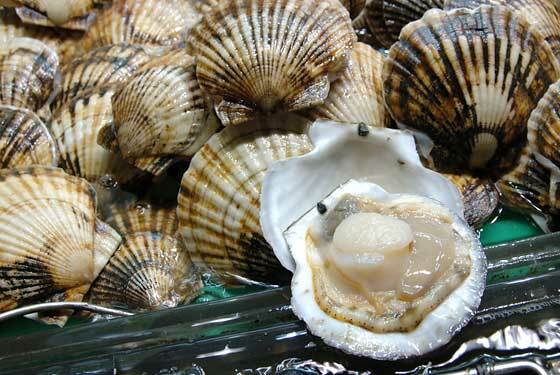 To prepare the scallop, remove the small side muscle, rinse with cold water, and pat dry thouroughly. In a nice 12 inch non-stick sauté pan add the butter and oil. Turn the burner on high heat. Salt and pepper the scallops. Once the butter/oil begins to smoke, gently add the scallops. This ensures that the oil is indeed hot and the scallops will sear on the oil and not stick to the pan (if you’re not using a non-stick pan). Make sure they are not touching each other, or they will stick to each other. Sear the scallops for 1 1/2 minutes on each side. The scallops should have a 1/4-inch golden crust on each side while still being translucent in the center. Remove outer leaves from cabbage. Cut into quarters, cut out white trunk. Slice cabbage into very thin shreds. Set large heavy pan over medium-high heat. Melt butter and add the bacon and caraway seeds. Cook until the bacon starts to brown. Add sugar and onion, cook until softened and translucent. Add cabbage, stir to coat well with the fat then add the salt. Next, add the beef stock and red wine. Cover and bring liquid to a boil, cook for 2-3 minutes, then remove from heat and add the vinegar, stir well, season to taste with salt and pepper. As an option for you picnickers out there… You can let this refrigerate this slaw for a couple of hours and serve this cold, or room temperature. You’ll notice that yes, this recipe is a whole lot like the last one. 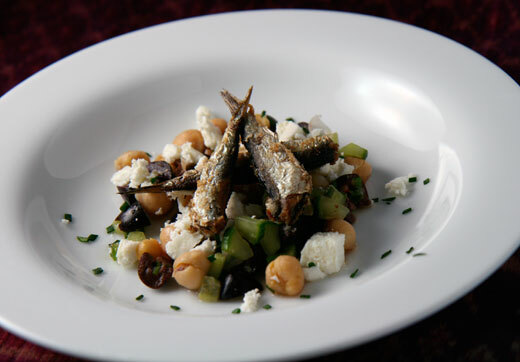 The last one, Sardines with chick peas and feta, is more Mediterranean, this variation is more Turkish, Persian. We are swapping out the chick peas for a good portion of bulgur wheat. Pack this with a cold-pac and it travels well… it is picnic season as I’ve mentioned previously. First, let’s get the bulgur wheat going. To prepare the bulgur, take one and a half cups of strongly boiling water into a heavy glass bowl, then add the bulgur and two or three tablespoons of olive oil and a juice of half a lemon. Stir together and let stand for about fifteen to twenty minutes. It’s just like making French-style couscous. Carefully lay sardine fillets out on a towel and pat dry. Make coating by combining flour, cornmeal, salt, pepper, cumin, paprika and cayenne. Set aside. In a medium bowl stir together the bulgur wheat mixture, cucumber, feta, olives, lemon zest and the other half of the lemon’s juice, mint and 1 tablespoon of the olive oil. Arrange equal parts of salad base on six plates. Dredge sardines through flour mixture and set aside, ready to be fried. Heat remaining olive oil over medium heat in a fry-pan large enough to accommodate the sardines in one or two batches. When barely smoking, carefully lay in sardines, working in two batches if necessary to avoid crowding. Sizzle fish in oil about 30 seconds on each side then carefully transfer back to dry towel to drain. Now, a word of caution here, make sure the pan is hot. This prevents the extremely delicate fillets from sticking. Stack the fillets on top of each salad and sprinkle with a pinch of chopped chives and a few cracks of black pepper. And yes, this still goes well with a Duck Walk white. This is an appetizer / salad course fresh from the sustainability desk, a somewhat Mediterranean inspired salad that incorporates canned sardines, chick peas, and feta as its prime components. If you are not a big fan of the chick peas, wait until I post a twist on this tomorrow. Pack this with a cold-pac and it travels well… it is picnic season as you know. In a medium bowl stir together chickpeas, cucumber, feta, olives, lemon zest and juice, mint and 1 tablespoon of the olive oil. Arrange equal parts of salad base on six plates. Stack the fillets on top of each salad and sprinkle with a pinch of chopped chives and a few cracks of black pepper. This does indeed go well with a Duck Walk white. In a large heavy saute pan, heat the oil over a medium-high flame. Add the chicken pieces to the pan and saute just until brown, about 5 minutes per side. If all the chicken does not fit in the pan, saute it in 2 batches. Transfer the chicken to a plate and set aside. Add the bell pepper, onion and garlic to the same pan and saute over medium heat until the onion is tender, about 5 minutes. Season with salt and pepper. Add the wine and deglaze the pan. Simmer this down to reduced it by half, about 3 minutes. Add the tomatoes with their juice, and oregano. Return the chicken pieces to the pan and turn them to coat in the sauce. Bring the sauce to a simmer. Continue simmering over medium-low heat until the chicken is just cooked through, about 20 minutes. Using tongs, transfer the chicken to a platter. If necessary, boil the sauce until it thickens slightly, about 3 minutes. 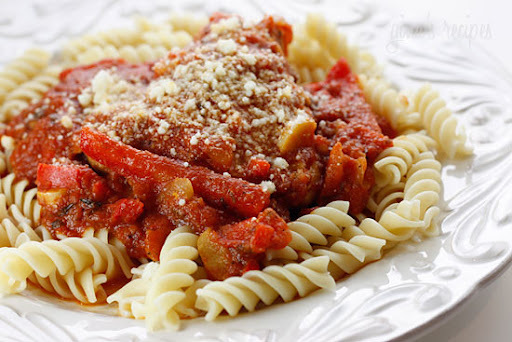 Spoon off any excess fat from atop the sauce. Spoon the sauce over the chicken, then sprinkle with the basil and serve with a nice side of pasta (my preferred pasta for this is the rotelli because it holds the sauce nicely). Squid… I know, everyone’s tried fried calamari, and a lot of people don’t like unhealthy fried foods. But today is not a calamari day. Its stuffed squid day! Squid is healthy and nutritious seafood that rates favorable on our sustainability scale. There are several ways to work with this often overlooked delicacy, but today is stuffed squid day. Heat the olive oil in a medium saute pan over medium heat until shimmering. Add the onions and salt and sweat until the onions turn translucent, about 1 to 2 minutes. Do not brown them, then add the garlic and continue to cook for another minute. Transfer this mixture to a medium mixing bowl and let cool. Clean the squid thoroughly and remove the heads from the tentacles and discard the heads. Turn the tubes inside out as the outside skin tends to curl outward, it’ll curl better inside out, put them into a bowl with some ice and set in the refrigerator until ready to use. Place the tentacles and the shrimp into the bowl of a food processor and pulse 6 to 8 times or until there are no large pieces visible. Do not process until smooth. Now, if you don’t have shrimp, a reasonable alternative here would be crab meat, or even left over lobster, but who would have any lobster left-over. Now, transfer this to the mixing bowl along with the onions and garlic. Add the bread crumbs, tomato, lemon zest, ginger, parsley and pepper. Stir to combine well. This is the stuffing mixture. Now, here’s a handy trick that I saw on “Good Eats”, place the mixture into a re-sealable freezer bag and snip a corner. Pipe the stuffing into the tubes. Do not over-stuff. 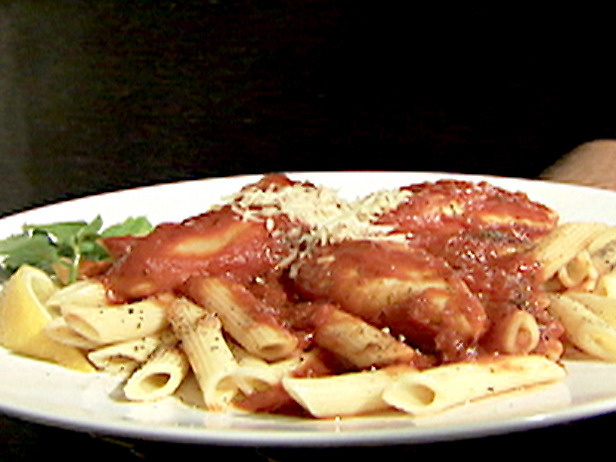 Place the tubes into an 8 by 11-inch glass baking dish and cover with the pasta sauce. Cover tightly with aluminum foil and bake for 30 minutes. Serve immediately. I like to serve it over pasta.